Quasars are supermassive black holes that sit at the center of enormous galaxies, accreting matter. They shine so brightly that they are often referred to as beacons and are among the most-distant objects in the universe that we can currently study. New work from a team led by Carnegie's Eduardo Bañados has discovered 63 new quasars from when the universe was only a billion years old. (It's about 14 billion years old today.) This is the largest sample of such distant quasars presented in a single scientific article, almost doubling the number of ancient quasars previously known. The findings will be published by The Astrophysical Journal Supplement Series. 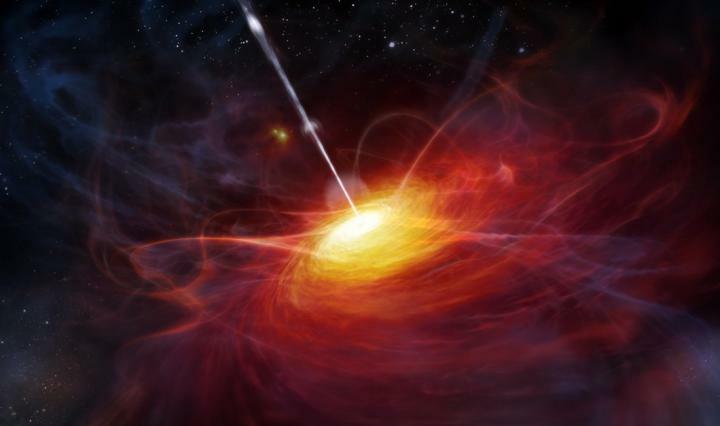 "Quasars are among the brightest objects and they literally illuminate our knowledge of the early universe," Bañados said. But until now, the population of known ancient quasars was fairly small, so scientists' ability to glean information from them was limited. One of the main challenges is finding these distant quasars, which are extremely rare. Scientists have searched for them for decades, but the effort is comparable to finding a needle in a haystack. The universe was created in the Big Bang and hot matter exploded everywhere. But then it cooled off enough for the first protons and electrons to form and then to coalesce into hydrogen atoms, which resulted in a dark universe for a long time. It wasn't until these atomic nuclei formed larger structures that light was able to shine once again in the universe. This happened when gravity condensed the matter and eventually formed the first sources of illumination, which might have included quasars. There is still a lot about this era when the universe's lights were turned back on that science doesn't understand. But having more examples of ancient quasars will help experts to figure out what happened in those first billion years after the Big Bang. "The formation and evolution of the earliest light sources and structures in the universe is one of the greatest mysteries in astronomy," Bañados said. "Very bright quasars such as the 63 discovered in this study are the best tools for helping us probe the early universe. But until now, conclusive results have been limited by the very small sample size of ancient quasars."